With all the Survivor Series talk going on, and being this is Thanksgiving week, a Survivor Series post is most definitely in order. Recently I wrote about the main event of Survivor Series 2010, and last year around this time I wrote about how the Survivor Series was once a Thanksgiving Tradition. Today I look back at once of the most historical moments in Survivor Series history. 1990 was a great time to be a WWE fan. Back then, we only got to see the top Superstars battle it out a few times a year, which made for awesome hype and excitement. We also got months worth of buildup which gave an energy that is lacking from today’s pay per views. One of the most talked about matches was Dusty Rhodes team of the Hart Foundation and Koko B. Ware taking on Ted Dibiase’s team of Rhythm and Blues and a mystery partner. For weeks Dibiase had promised a big, BIG surprise for the match. As I watched the show live on Thanksgiving Eve in 1990, I remember thinking that this would be Andre the Giant’s return to the ring, seeing how Dibiase kept emphasizing the word “BIG” and Dibiase had a history with Andre. As Dibiase grabbed the mic and announced that his mystery partner was accompanied by his manager, Brother Love, I knew we were in for something new being that Brother Love hadn’t managed anyone before. “From Death Valley….The Undertaker!” The music was fitting, the look was good, the excitement of seeing a new star was there. As the Undertaker entered the ring and removed his hat, my first thought was “that’s Mean Mark Callous from WCW!” Knowing that this new Undertaker was someone I watched as a regular wrestler in WCW and now trying to pull off some sort of dead guy character was interesting to say the least to me as a 10 year old who wanted to believe it all. I guess WWE was so fun at the time, it didn’t bother me and it was enjoyable to see this new monster dominate in his debut. 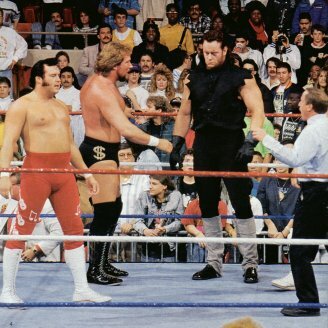 While The Undertaker didn’t win in the match, he wasn’t beaten either, as he brawled with Dusty Rhodes and both were counted out after The Undertaker had made a huge impact in the match.